Sunita has grown too big for her little silver bike but is reluctant to ride the new pink bicycle she is given because it doesn't have stabilisers. The situation is resolved, however, on a a family picnic when her treasured blue rabbit is blown down a hillside by gust of wind and, without any hesitation this time, Sunita seizes her bike and pedals off to perform a rescue. 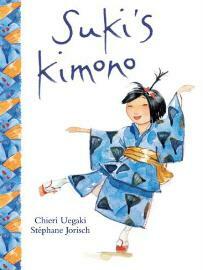 The illustrations treat this everyday story of a young girl of Asian heritage learning a new skill with gentle humour.